for filling in a lot of holes in my knowledge of video. Fascinating! That 4K does look like quite a memory hog, not to mention the size the data highway to refresh is going to have to be. If our brains are the ultimate "standard" for video capture and processing, then a lot more of our brains must be used than scientists now think is used to store video memory. We associate smells quickly with a memory so we have a fairly significant area doing that. But when it comes right doen to it, if I say I "remember" an event or a person, it is because I have "film clips" of the event or the person stored in my brain somewhere. At any rate, thank you for the food for thought. I think too much sometimes but it's fun to do. I'm saving a lot on heating bills. Last year the first frost (average September 15 for this area) was 23 days late. It is now October 13, 2013 and we still haven't had our first frost. Around here, the first snow comes within a few days of November 1. I expect that will be late as well. I will post here as these events come to pass. On a negative note, I just came back from a doctor visit. He only talked about high cholesterol. However, a few days after the doctor visit, the doctor's office send me my lab work (Comprehensive metabolic panel - CMP). It shows a low Total Protein reading (mine is 5.9 and normal is 6.5 - 8.3 g/dl). It's a bad sign. What really bends me out of shape is that the doctor said nothing about it and only mentioned my somewhat high "bad" cholesterol (186). I am CERTAIN he had those CMP lab reports and the nurses that e-mail me my lab test "chose" not to send the negative one until the doctor "approved" it. Why? Because I normally get all my test results before the doctor visit and I DID get the other two (AiC and lipid profile taken from blood samples the same day as the CMP blood sample) before but this CMP work was sent to me AFTER the doctor visit. Anything negative on a lab report that may require extra attention for a patient obviously has some in-house protocol forcing the nurses to put a hold on it until the doctor gives the go-ahead. I am not a local and have seen how these folks fall all over themselves to help a local and GO OUT OF THEIR WAY to avoid helping an outsider while they play at being dumb and treating everybody exactly the same. No, I can't go to another doctor. This guy is probably the most non-prejudiced of the three doctors in Vermont I have had the misfortune to deal with. I have to use my wits to "keep them honest" and get proper medical attention. It's the doctor's office that requires the lab visit be only 3 days to a week before the doctor visit to "ensure" current results. We specifically had asked to have the lab work done about ten days prior to ensure the doctor had the results and they said it must be 3 days to a week. So it goes. At any rate, they are going to have their hands full if they think I am not going to research the daylights out of this and make an e-mail track record of my requests so they can't dance around the extra tests I will need. For now, I am going to request (politely, of course) an SPEP (serum protein electrophoresis). The green covers what a normal SPEP test looks like. The reddish color is just one type of abnormality (that I probably DO NOT have because it would provide a "too high" Total Protein reading rather than a "too low" Total Protein reading). We'll see how this turns out. It may be a fluke or instrument error. Somebody told me once, "it's all downhill after 45". Yep. Anyhow good luck, and let me know how it's going. As to "all downhill after 45," well, QED! Thanks. I'll let you know what develops. Any news on the test evidence? Point 4 seems to be the money shot. Bullseye. You might be overplaying your hand in point 5-- going in to a potential diagnosis without the training. Might softpedal that. Otherwise, they have asked you to be a "full partner" in your own care? You are clearly holding up your end. Thank you for the advise and encouragement. I was going to send it today but my wife said it would be better to send it monday. I said they may get upset at my delay and she said probably not. They aren't in any hurry to do anything so as long as I don't answer they don't feel they have to act. I said okay. Monday it goes out. Please let me know what happens. This ought to be interesting. I sent the letter with some slight modifications to appear less confrontational. Hoping that I am not presenting an irrational or paranoid (and unnecessarily costly) overreaction to the 5.9 g/dl Total Protein test result, let me explain my logic upon learning of the test result. 1. I received it a few days after our appointment so I would not be able to discuss it with you until our next appointment. 2. I researched it and found that the average range in US labs is 6.0 - 8.3 g/dl. The lab for my test uses the 6.5 - 8.3 g/dl range. 3. My wife called up her medical technician sister in law that has owned a medical lab in Puerto Rico for couple of decades to ask what the normal course of action is. She said an SPEP is done. She explained the requirement to calibrate the machines doing tests daily with a test sample and why different labs have different ranges. 4. Upon hearing this I made what may be an incorrect, but logical, assumption. That is, that a 5.9 g/dl Total Protein in a range of 6.5 - 8.3 g/dl, being a full 0.6 g/dl below the bottom range calibrated for lab machine test results is a bona fide low reading. Had the calibrated range been 6.0 - 8.3, I would have gone the 'let's do a repeat' route of logic but when the total acceptable range (6.5 to 8.3) is only 1.8 g/dl, a 0.6 outlier represents a 33% deviation below the minimum range. 5. 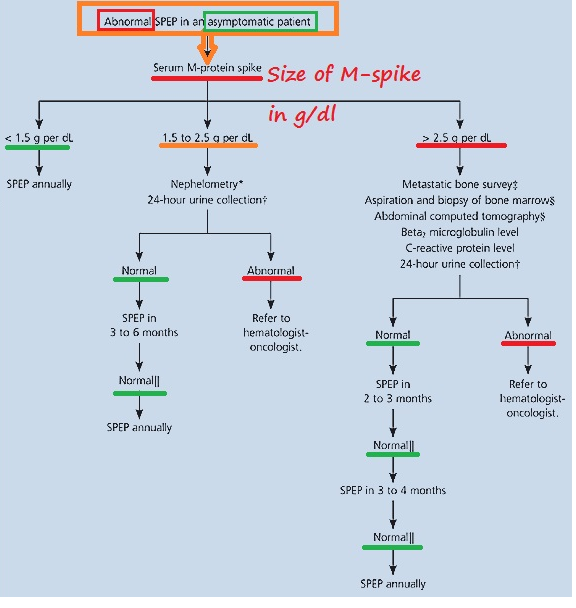 After researching the SPEP, I learned about the Alpha one and two, Beta, C reactive protein and Gamma patterns along with the Albumin spike and that the Total Protein values above the maximum range are the ones usually with the dreaded M-spike for multiple myeloma. So it appeared to me I might have some kind of anemia that hadn't showed up anywhere else in my blood work or a possible kidney problem. I realize that I'm probably making a mountain out of a molehill (instrument error). 6. After thinking it over I came to the conclusion that the best way to get to the bottom of this mystery is to do the SPEP because it will, in addition to providing the Total Protein score in a separate procedure (that may be used as evidence by your staff to request the lab run more stringent calibration tests on the machine that does the CMP Total Protein test) from the CMP Total Protein, provide you with a baseline normal or abnormal detailed Total Protein breakdown that you can use to aid in caring for my health in the future. I hope to continue being your patient until I kick the bucket so the data provides valuable research for you on patient aging and health deterioration. After reading your reply I went over the costs. Last year, when I went to the ER two times, I was the cause of a lot of costs but I did turn down a very expensive radiocardiogram a cardiologist who saw me at the ER wanted to do. And later on this year I decided to forego the colonoscopy which translates to a large cost saving for the system. The SPEP and UPEP, compared to the two test procedures above, are much less costly. As you told me, you have experienced issues with the test result scores previously. It seems to me that a future score in the acceptable range is equally as questionable as an out of the range score unless two separate and distinct tests (SPEP and another CMP Total Protein) are done to compare the results. Sorry for being so long winded but I wanted to make sure you understand that I am only trying, as you and your staff have urged me to do since I became your patient, to be an active partner with you in my health care. You are the doctor and I do not question your knowledge, authority or experience in health matters. I realize that you are looking at the big picture and probably don't see any additional diagnostic flags (like bad calcium levels or something like that) that would trigger a diagnostic reason to have an SPEP done. My preference is for an SPEP UPEP but if you still feel it is not warranted, I would request we repeat the CMP Total Protein now, and if the result is within range, repeat it again within 3 months to ensure the machine is properly calibrated. I am convinced. SPEP and UPEP are ordered. Glad to remain your doctor! Wonder of wonders! I actually convinced the doctor! Now I hope to get to the bottom of why I had that low reading. We shall see. I'm going to do some research on globulins, what they do in particular and what the proper (normal) fractions are in the total protein and what more or less or whatever of one or two groups means. IF, I have a problem, there are more tests downstream where they get even more precise. Let's hope it was an instrument error. The UPEP is a 24 urine catch (you keep a container at home in the fridge and fill it for 24 hours, then take it to the lab) so that next step is already going to be covered. I too, am anxious to see the results so I hope to do the tests this week. I'll let you know the results as soon as I get them. AG, that is terrific, that you convinced him. Good for you you've got a doc amenable to being convinced. I have not received my instructions from the lab yet. I guess my doctor means to have me tested in late December before our January appointment. Don't ask me why he said he was anxious to see the results. I'm scratching my head about that too. Maybe doctors have different definitions of "anxious" than we do. Whoops! It turns out the instructions have been at the lab since the Doctor scheduled them but the lab never bothered to send me written instructions. I expect to get the SPEP and UPEP done within two weeks. I'll report on the results here. My SPEP looks almost exactly like the green (normal) SPEP above. My total protein was exactly the minimum amount (6.5 g/dl in the normal range of 6.5- 8.3 g /dl). My triglycerides are a little high (went from 131 in October to 221 now) but anything under 500 is really not that big a deal. Besides, my LDL (calculated) went down from 160 to 143 ( which is an improvement). The Doctor mentioned Lipitor and I proceeded to discuss the risks and asked that we just wait a year and check again while I try to lower the triglycerides with diet. He agreed. My blood pressure was PERFECT at 110/70! So since the SPEP is okay, the plan is to work my diet to lower the triglycerides. LDL cholesterol and simultaneously raise the "good" cholesterol (HDL). One day at a time. So, thanks be to God, I appear to have some more time left on planet earth. Tough luck for the fossil fuelers. Truly splendid news. With labs and a B like that, you may love forever! Well done, and good to know we'll have for brand of truth-telling with us for a while longer!